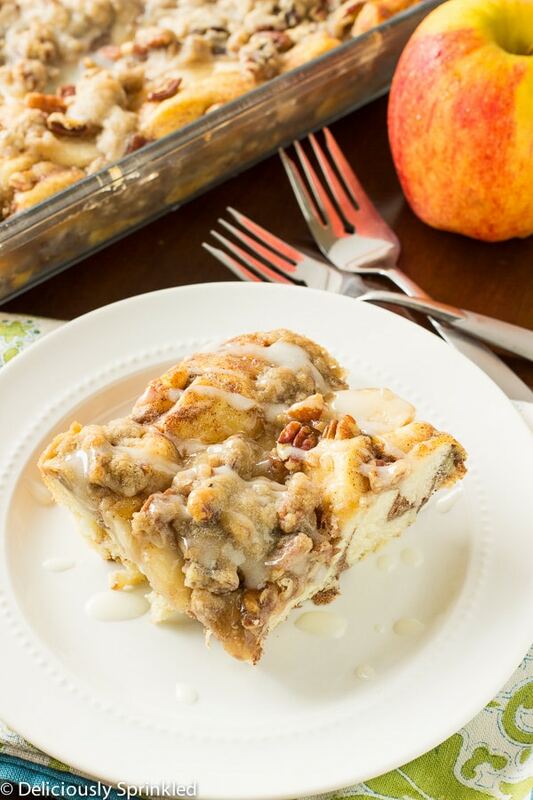 This delicious Apple Streusel French Toast Bake will keep your Fall taste buds into overdrive! Fall is coming…I can literally feel it in the air. And with fall comes all the most amazing scents and flavors that one can even imagine. While I’m a huge fan of pumpkin, I also can’t deny that I equally love apple as well. 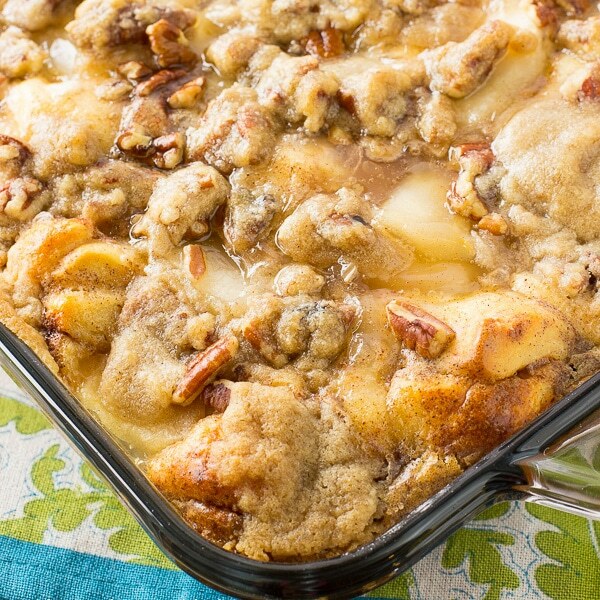 This Apple French Toast Bake is truly one of the best ways to start a brisk Fall morning! I often find myself thinking of new ways to combine great dishes, and when this idea hit me, I knew it was perfect. French toast is already yummy on its own, but with the flavors of ripe apples? Forget about it. One bite, you’ll be forever hooked. I love having this as an option for overnight guests, or as a great dish to take to tailgating for those early football games. While it seems as though one batch would feed quite a few, I always encourage people to make extra because it will go really quick! However, you prefer to bake and share, enjoy making those around you smile and fall in love with food again! Great dishes are the perfect way to bond over incredible food! ● BUTTER: 1/2 cup (1 stick) butter. ● BROWN SUGAR: 1/2 cup of light or dark brown sugar. 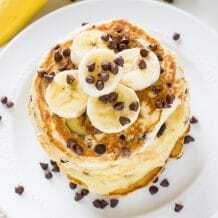 ● FLOUR: 1/2 cup all-purpose flour. 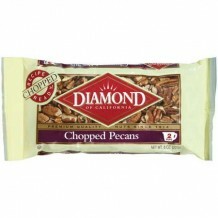 ● CHOPPED PECANS: 1 cup chopped pecans. ● HEAVY WHIPPING CREAM: 1/2 cup heavy whipping cream or milk. ● NUTMEG: 1/4 teaspoon nutmeg. 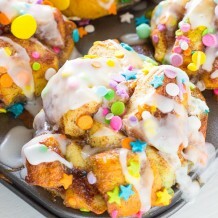 ● REFRIGERATED CINNAMON ROLLS: 2 cans refrigerated cinnamon roll dough. ● APPLE PIE FILLING: 1 can apple pie filling or you could use fresh apples. PRE-STEP: Preheat oven to 350F degrees. Spray a 9×13 inch baking dish with non-sticking cooking spray. Set aside. STEP 1: In a small bowl, combine butter, brown sugar, flour, cinnamon and chopped pecans. Mix together until mixture becomes crumbly. Set aside. STEP 2: In a large bowl, whisk together eggs, heavy whipping cream, flour, cinnamon, nutmeg, and vanilla extract. STEP 3: Open canned cinnamon rolls, slice each cinnamon roll into eighths. Place cinnamon roll pieces into prepared baking dish. Pour egg mixture over top of cinnamon roll pieces. Make sure that each piece is generously coated in egg mixture. STEP 4: Evenly spread apple pie filling over top of cinnamon roll pieces. STEP 5: Sprinkle streusel topping over apple pie filling. STEP 6: Bake uncovered for 45-60 minutes or until top becomes lightly brown. 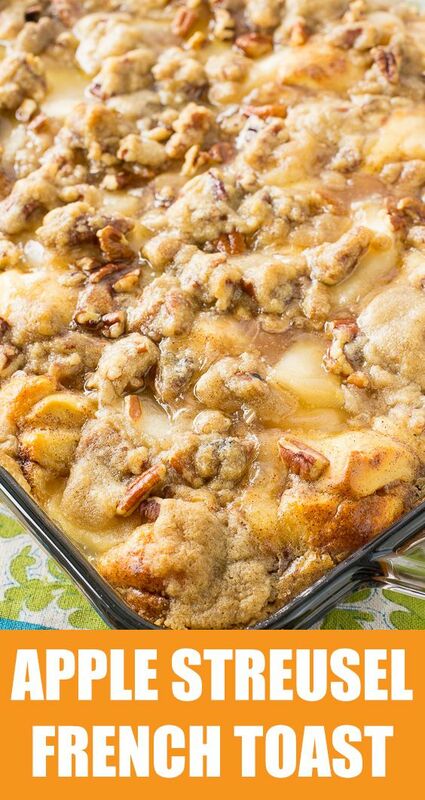 Drizzle cinnamon roll icing over top of french toast bake and enjoy! CINNAMON ROLLS: I used Pillsbury Grands Flaky Supreme cinnamon rolls for the french toast base. You could also use a couple day old french bread, if you do use french bread, make sure to add some more ground cinnamon. 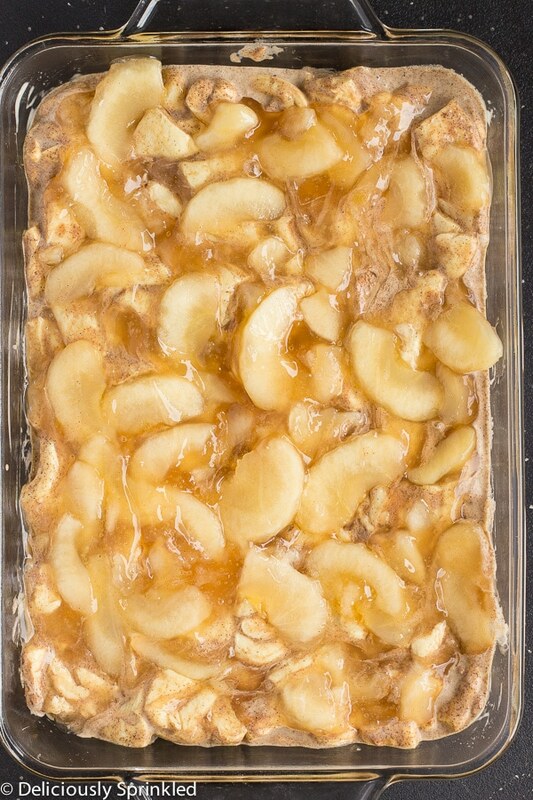 APPLE PIE FILLING: I used apple pie filling in this french toast bake, but you could use fresh apple slices too. 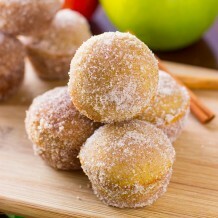 I love using fresh apples, especially in the fall when it’s apple season. Fresh apples make this french toast outstanding but if it’s not apple season then apple pie filling tastes just as good and so much easier! CREAM CHEESE ICING: Before serving, I like to drizzle the cream cheese icing that comes with the cinnamon rolls over the top of the french toast bake. You could also keep it plain or dust powdered sugar on top instead. 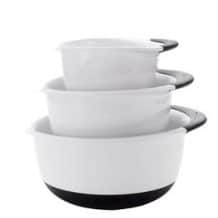 MIXING BOWLS: These are my go-to mixing bowls, I use them for everything. WHISK: Everyone needs one or two really good whisks in their kitchen and this one is the best. 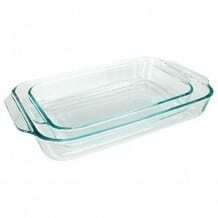 9×13 INCH BAKING DISH: This is my favorite baking dish. 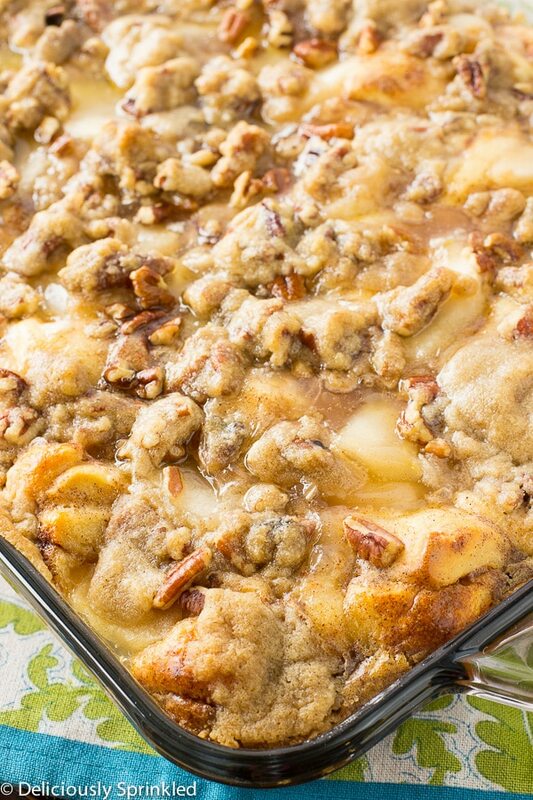 Our family loves this amazing french toast bake! I think it needs to happen again for Christmas morning! Perfect for the holidays! 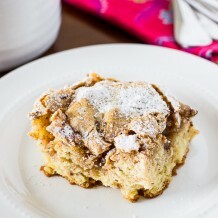 That streusel topping looks divine! Oh my gosh this sounds amazing! Can’t wait to try! Sounds delicious! The ingredients are ones that I usually have around. I might try to make this for Christmas morning breakfast. My whole family really enjoyed this! It was so good! If I use fresh apples, do I have to make apple filling or can i just toss apples on top of cinnamon rolls? Nope, you can just toss the fresh apples on top! I love using fresh apples! So glad autumn is knocking….. this one is just perfectly suitable 🙂 Thank you very much ! Is the butter softened or melted? If i use fresh apples, how many to slice? If I want to make this ahead of time should I cook it then freeze it and re-heat? Or just prepare it and freeze and cook it the next morning? Do you think it would be alright if I froze it? Can I make this in th crock pot? Would like to make this for a potluck, but need it to stay warm. 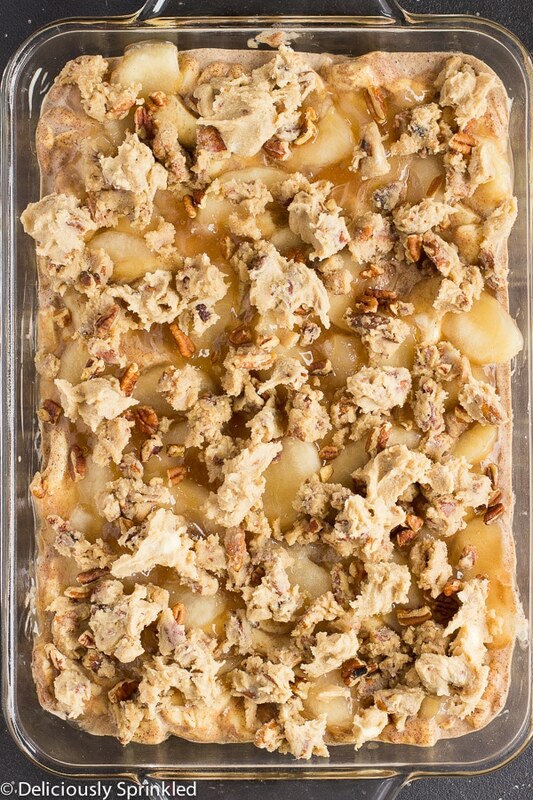 I just put this in the oven and realized I didn’t add the pecans to the streusel topping mixture. You may want to revise your recipe to make sure the steps include adding those. Hopefully it will be good without them. Thanks. I made this today for my family. And only had one can of cinnamon rolls, so I added about 6 slices of white bread, torn into pieces and mixed it all together. And it turned out GREAT! Thanks so much! This looks delicious! I was thinking about making this Friday for brunch for my in laws. I just have a few questions in regards to the recipe. I went grocery shopping today and they only had the regular cinnamon rolls not the flaky ones. Would it make a difference if I used the regular one? Also, I was thinking about making the entire dish Thursday night but I’m afraid it won’t turn out as fresh and it might become all soggy and weird! Definitely wouldn’t want that to happen. Do you think it’ll be okay if I mAke the entire dish Thursday and just pop it in the over Friday? 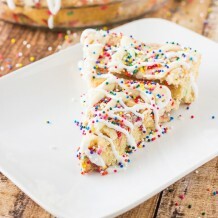 Planning to make this for Christmas morning! would it make a huge difference if I didnt add the nutmeg? I made this today for my Mom’s group and everyone LOVED it! A couple of things i did different. I added an extra can of apple filling (not sure what oz. 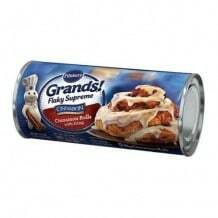 but they were smaller) and i bought flaky Cinnamon rolls with caramel icing. I would highly recommend this recipe! Can I prepare this the night before and put it in the oven the next morning? Looks delicious. Wow, this looks amazing. I can’t wait to make it for a holiday breakfast!